"Will Smith caught Jada and Marc Anthony in his own home" In Touch said. Will Smith and Jada Pinkett Smith have separated? The US In Touch magazine yesterday release claimed Will Smith and Jada Pinkett Smith’s marriage is in crisis because of the Jada’s relation with Marc Anthony. 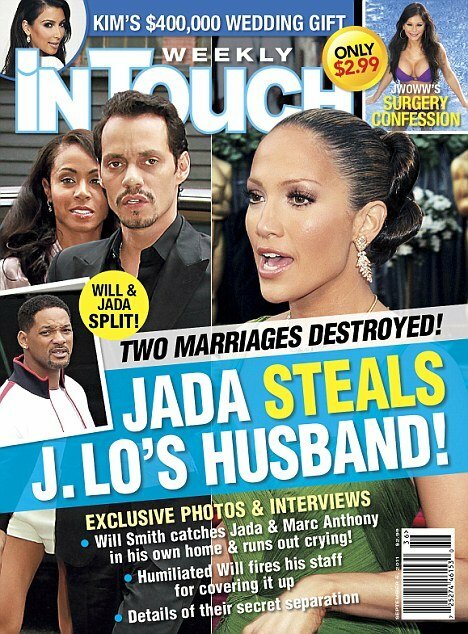 InTouch magazine made a series of claims in a six-page-long article,even alleging Will Smith caught Jada and Marc Anthony in one of their homes in Los Angeles. Tuesday Will Smith and Jada’s spokespeople made two separate statements denying claims the couple have separated after InTouch released a statement, pre-empting yesterday’s explosive edition. Marc Anthony’s spokesperson also “unequivocally” denied reports the American singer-songwriter was involved in an off-screen affair with his Hawthorne co-star Jada, after the rumour mill went into overdrive. Marc Anthony divorced from Jennifer Lopez last month. On Tuesday it was reported that Will and Jada have now got their legal team involved as the plot possible legal action to take against In Touch magazine. It alleged Will made a surprise visit to the house in early August “under the cover of darkness” and found his wife with Marc. InTouch also claimed Jada moved out of the house the next day – while Will fired several staff accusing them of covering things up. In Touch alleged things have been a long time coming. Another source revealed there was a visible sexual tension between Jada and Marc on the set of TNT medical drama, Hawthorne. When Marc Anthony began playing the on-screen lover of his co-star, workers on set noticed the chemistry between them, In Touch reported. There were also playful exchanges on Twitter between Jada and Marc, saying how much fun they were having working together. But it was when Marc Anthony split from J.Lo last month that alarms bells started ringing for Will Smith, according to In Touch. Meanwhile a source close to Will and Jada told gossip website TMZ.com that they have decided to go away with their children on a family holiday before deciding what to do, but the prospect of a split in the near future is “definitely a possibility”. Steve Jobs resigns forced by pancreatic cancer?